On December 14th, 2009, Elena Kostioukovitch presented the Spanish edition of her book 'Why Italians Love to Talk about Food' published by Tusquets Editores, Spain, as 'Por qué a los Italianos les gusta hablar de comida' at the 'ALGUSTO Saber y Sabor' International Food&Cuisine Show. 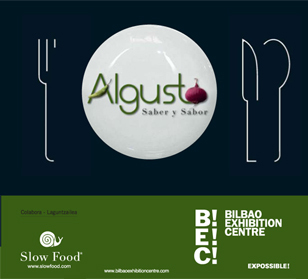 The second edition of ALGUSTO, Saber y Sabor, a major event in the food and cuisine calendar jointly organised by Slow Food International and the Slow Food convivia in Spain, took place between December 11th and 14th at the Bilbao Exhibition Centre (BEC). ALGUSTO, Saber y Sabor (Knowledge and Flavour) was born out of an agreement reached between BEC and SLOW FOOD. The aim behind the show, the only one of its kind in Spain, is to promote the philosophy that the Slow Food movement has been championing all over the world for more than 20 years now. Inspired by Turin's Salone del Gusto, ALGUSTO opens its doors to the general public and is a reference point in the artisan food and cuisine industry. The presentation of Elena Kostioukovitch's 'Why Italians Love to Talk about Food' took place in the Conference Hall 2 of Bilbao Exhibition Centre on December 14th, 2009, at 11.00.